Jennifer Leach didn’t expect much from the doctors. It was 2007, and she had been living in a Napa homeless shelter for a few months. She knew what kind of health care to expect for people like her, who struggled with poverty and homelessness: treatment in a sad, shabby clinic. Spotty, inconsistent medical care. Taking three busses across town to see the one specialist she needed, only to discover that the office is closed on Fridays. Once homeless, Jennifer Leach struggled to find health care until she discovered OLE health. “I was seen and treated as a human being” said Leach. That support helped her turn her life around. What makes the scenario even more remarkable is the location. When people imagine Napa Valley in Northern California, they usually picture a wealthy, bucolic paradise filled with the region’s sprawling vineyards. But for the people who help make that image a reality—Napa’s thousands of farmworkers and working poor—life isn’t easy. It’s only recently that people like Leach have been able to access quality care; for years, health care for low-income individuals in the area was essentially non-existent. That changed in 1972 when Napa farmworkers from Organizacion Latino Americana de Liberacion Economica (OLLE) started a clinic for uninsured Latino farmworkers and their families. It wasn’t always easy, and for years, they bounced around from location to location. During one year, they were even located in a Mexican grocery store. After nearly a decade of uncertainty, they finally settled in a permanent location in 1983, shortened their name to OLE Health and expanded their scope to all the poor and uninsured communities in Napa, not just farmworkers. Ole’s roots began when Napa farmworkers started their own clinic 1972. That work continues today both in their main facilities as well as at health fairs they hold near the fields to ensure care is accessible. Since then, OLE Health has been a lifeline for people like Leach. It’s Napa County’s only federally qualified health center—the sole option for Napa’s uninsured working poor. Before OLE, uninsured patients had to drive to another county to find a clinic that would treat them. Now, OLE is a place that honors its origins as a resource for Napa Valley farmworkers, while working as hard as they can to expand their reach by serving as many people as possible. It’s not just their patients that make OLE unique—it’s also their forward-thinking, innovative approach to health and wellness. About a decade ago, OLE adopted an integrated model of care that emphasizes behavioral health. When a patient comes in for an appointment with his or her primary care provider, the doctor connects them with OLE’s other in-house resources—from dentistry to counseling to acupuncture. The result is a team of providers working collaboratively on all components of a patient’s health, from chronic health issues to dentistry, and it leads to stronger patient-provider relationships. One recent patient constantly went to the ER, until a nurse took his cell phone, programmed his own number in it, and told the patient to call him whenever he needed help, day or night. It’s been six months, and the patient hasn’t returned to the emergency room. Doctors like the integrated model because it ensures patients easier access to valuable preventative care. Instead of sending them into the community with a referral, hoping the patient makes it to the therapist or nutritionist, they can simply check in with a colleague. It also makes it easier for doctors to do their jobs. They’re allowed to simply provide medical care, instead of acting as mix of doctor, therapist and psychiatrist. 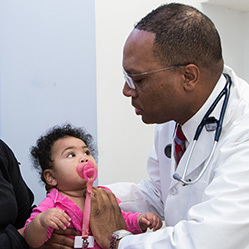 And unlike places where rushed, impersonal appointments are the norm, OLE’s doctors build connections with their patients. Jennifer Leach recalled a time when she remembered another issue just as her appointment ended and her doctor was halfway out the door. “Instead of just glancing over her shoulder and saying ‘Yeah, what?’ she came back in, shut the door, sat down, looked at me and said, ‘What else can I help you with?’” Leach recalled. Patients benefit the most from this streamlined approach. It’s convenient; everything they need is in the same building. They only have to fill out one set of paperwork. Patients can schedule appointments back-to-back, so they don’t have to schlep around the city to their specialists, cutting into valuable working hours. This integrated approach also extends to mental and behavioral health care, which often falls by the wayside for low-income patients. If a primary care doctor thinks a patient could benefit from behavioral health treatment, the doctor will do what’s called a “warm hand-off:” bringing a behavioral health provider into the exam room so the patient can meet him or her, get a few quick suggestions—breathing exercises, information on OLE’s many support groups—and schedule further treatment if necessary. The patient is then partnered with a mental health coordinator who develops a personalized treatment plan—like the OLE staffer who worked with a depressed patient who never got out of his pajamas, even wearing them to his appointments. After months of painstaking progress, he’s back to wearing overalls and working in his garden again. 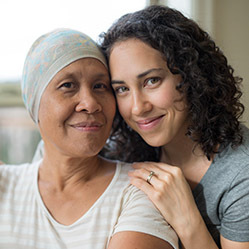 “Warm hand-offs,” which allow patients to meet both with primary care doctors as well as behavioral health specialists during one visit are a signature of the integrated health care system OLE provides. For many families, OLE is the only option. As a federally qualified health center their mandate—and mission—is to accept everyone, regardless of their ability to pay. 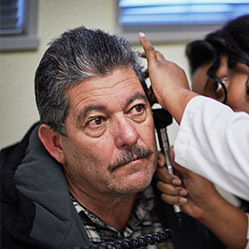 70 percent of OLE patients live below the poverty line, and most pay with Medi-Cal or on a sliding scale. One in four Napa County children rely on OLE for treatment, as do almost 20% of Napa adults. The majority of staff is bilingual, catering to the Hispanic patients who make up more than 60 percent of their patient population. And demand continues to grow. On average, OLE gets 300 new patients a month. They work with the community to expand their scope, going into homeless shelters and vineyard fields to reach patients where they live. In neighboring Solano County, people started to notice OLE’s success. Partnership HealthPlan of California, a program that offers services for the area’s Medi-Cal patients, was desperate for a facility in Fairfield, CA about a half hour from Napa. They needed a place they could trust to send their Medi-Cal patients. They reached out to OLE; could they open a new clinic in Fairfield? For many families, OLE is the only option. As a federally qualified health center their mandate—and mission—is to accept everyone, regardless of their ability to pay. It was a huge undertaking for OLE. They already had their own clinics to worry about—ones struggling to treat the influx of new patients. They didn’t have the decades of patient trust they had slowly built in Napa. They didn’t know if it would even work logistically; how could they build a new clinic with the same level of quality integrated care? For a year, they strategized how to duplicate their successful model at a brand new facility. And the challenges didn’t stop there. Many lenders consider health care facilities for underserved communities a risky investment. That’s why OLE turned to Capital Impact. As a mission-driven lender, Capital Impact’s focus is driving social impact and increasing access to critical services like health care. Indeed, Capital Impact has a long history of aiding federally qualified health centers with their life-saving work. They’ve financed more than half of FQHCs in California. In the fall of 2016, Capital Impact played a vital role in supporting OLE’s new Fairfield location with $1 million in financing from Capital Impact’s CPCA Ventures loan program geared toward supporting California health centers and clinics. With this loan, OLE transformed an outdated clinic in the area into a modern day facility with seven exam rooms, four dental stations, a lab and two consultation rooms outfitted with state-of-the-art equipment. On average, OLE gets 300 new patients a month. To ensure they meet the increasing demands of the growing population, they offer a broad spectrum of care including maternity counseling. The CPCA Ventures Program has made a significant impact in the region: the nearby Petaluma Health Center and Axis Community Health in Pleasanton have also received vital financing from the fund, expanding the network of care available to vulnerable Northern California communities. Recently Capital Impact debuted its $20 million Healthier California Fund to complement its CPCA program by providing multi-million-dollar financing to clinics serving low-income and uninsured communities. So far, the Fairfield facility has been a success. “Patients are starting to come in droves,” said Ami. “They’re very happy with the care and the facility.” The clinic is bustling and bright, decked out in colorful holiday decorations. Doctors greet patients like friends, asking about kids or getting help with their Spanish pronunciation. In the waiting room, the cheery staff cracks jokes with each other over soft Spanish-language radio, as kids play with a pile of toys or read books like Where The Wild Things Are or Werewolves Don’t go to Summer Camp (thanks to a collaboration with the local library, kids are encouraged to take any of the books home with them). Elizabeth Thorpe and her daughter have been patients at OLE for six months. Thanks to a collaboration with the local library, she can borrow books from the waiting room to take home. “At OLE I feel like they genuinely, passionately, care about their patients,” said Thorpe. Part of OLE’s success comes from the fact that many of its staff members grew up in Napa and were OLE patients, so they have a connection to the people they’re serving. Patients aren’t just numbers; they could be a cousin or neighbor. The staff members’ empathy for their patients means they recognize that quality of life doesn’t just revolve around medical care, and that low-income communities have unique struggles that can affect their health. OLE’s staff will find someone a bed at an emergency shelter, give them a box of free vegetables from a local food bank, or encourage them to join its free immigration aid group. And as OLE grows, it is committed to maintaining its patient-focused approach, talking to patients in person, using social media and organizing focus groups to identify patients’ needs. Part of OLE’s success comes from the fact that many of its staff members grew up in Napa and were OLE patients, so they have a connection to the people they’re serving. That homegrown care is bolstered by the fact that FQHC’s like OLE have patient advisory boards, where patients meet with staff members once a month to help doctors and staff shape decisions about care. Jennifer Leach joined the OLE committee earlier this year. She’s not homeless anymore but still receives treatment at OLE.